There is a close resemblance between Nigerian politics and club football. The comparison may seem so weird but it can be better understood when narrowed down to the culture of defection shamelessly practised and celebrated by our politicians. Petr Cech enjoyed an 11-year stint at Chelsea football club of England in the face of bitter rivalry with Arsenal but today, he is holding the goal post for the gunners. In the same vein, politicians that have berated each other during stiff political contests by virtue of their membership of opposing political parties have united indirectly against the electorates to cement their interests. When I read about the imminent defection of the former Governor of Oyo state, Otunba Christopher Alao-Akala to the All Progressives Congress, APC; I prayed it was a mere rumour even though I was convinced it was true. Akala may not directly represent, but he is from the old days of 'Amala politics and Gbegiri' in Oyo state where the concept of democracy was painted as a 'demonstration of craze' according to the late musician, Fela Anikulapo Kuti. He is an old player from the days of the politics of patronage and godfatherism in the South-western state. The key player was the late Chief Lamidi Adedibu of Molete area (makeshift government house) in Ibadan. The old days when 'might was right' and the electoral process was controlled my thugs who virtually wielded more power than the police. An era where elections in the state were like war fronts with only warriors summoning courage to cast their votes. The days during which the good governance is measured by the ability of a leader to share his loots among his friends and associates thereby leaving capital projects to suffer. The days when a private individual was alleged to have 6 voters’ registration machines of the Independent National Electoral Commission in his house with the police looking the other way. The dark times when Ibadan was tagged the 'city of brown roofs and home of the dirty people'. The tough times when thugs had the audacity to attack a Television station in broad daylight with a Newscaster taking to her heels while on air. The ugly period when thugs beat lawmakers at the National Assembly and stripped one of them naked for the full glare of the general public without any judicial implications. The only time a governor in Oyo state was trending nationwide those days in the social media was on strong allegations and jokes about skin bleaching. I am not trying to paint Akala the devil in anyway. No politician is 'actually' clean especially in a continent like Africa where greed is endemic. This was probably one of the major reasons Nigerians raised eyebrows when Pastor Chris Okotie of Household of God Church ventured into politics. Politics entails so much lies that are presented as diplomatic talks. When I watched video clips of the current Vice President of Nigeria, Professor Yemi Osinbajo who happens to be a pastor at one of the largest ministries in Nigeria, Redeemed Christian Church of God endorse the likes of the former governor of Rivers state, Rotimi Chibuike Amaechi who has a fraud case of N53 billion hanging on his head and also his endorsement of the late Kogi gubernatorial candidate of the APC, Abubakar Audu who allegedly stole N11 billion from state coffers, I felt for Osinbajo's heavenly race. I have heard people tell me that my life will change if I encounter Akala. Yes, he could be changing lives individually but the state exists for the general will of the people. It was a fierce contest between Senator Isiaka Abiola Ajimobi and Akala in the 2007 gubernatorial election during which Ajimobi was defeated under the banner of the All Nigeria People Party, ANPP. There was a glimpse of hope for him as he was the first runner up in the election. Conventionally, there were cases of gnashing of teeth common among politicians. The demise of Chief Lamidi Adedibu in 2008 after a protracted illness weakened the political influence of Akala. Akala headed to the polls in 2011 and was defeated by Ajimobi who contested under the Action Congress of Nigeria, ACN. The people of Oyo state were probably tired of the 'old politics' and needed a change before the APC adopted the slogan. Fast-forward to 2013, Ajimobi fell out with the traders in Ibadan when he started demolishing illegal structures and sanitizing the city to prepare the state for capital projects. Several petty businesses met their abrupt end and this gave Akala and Accord Party candidate, Rashidi Adewolu Ladoja hopes of a comeback to the gubernatorial seat. Akala bluntly attacked the policies of Ajimobi; there were cases of character assassination as the supporters of Akala started spreading out like wild fire under the Labour Party. 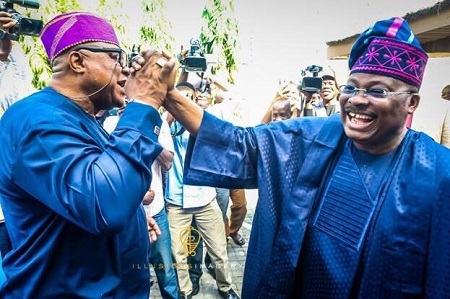 Although, unconfirmed reports have it that Akala covertly worked for Ajimobi during the electioneering campaign due to his perceived consequences of the emergence of Ladoja as governor that may spell doom for him due to their long-term feud from the days of Adedibu. “Using Buhari’s name rather than his (Ajimobi) achievements is the greatest undoing a sinking governor can do to win at all cost. Buhari did not award contract at questionable amount or neglect meritocracy for mediocrity. “The APC administration is anti-masses as it has inflicted pains on the people as against its campaign promises in 2011. “Ajimobi is the most corrupt governor in the history of the state while Buhari is the only former head of state without a house in Abuja and the only former leader without an oil bloc. How then does Ajimobi think using Buhari’s name to campaign will guarantee him victory?” Alao-Akala wondered. I am sure Ajimobi would have been dead if he was unfortunately present at the party's office. In summary, Akala placed a call to congratulate Ajimobi on his victory at the 2015 gubernatorial election and as part of a calculated plan, went mum on his constant criticisms. “He is not in APC, however if he wants to join APC he is welcome. Let him join from the ward level. That is how it is done. “It is very strange to us. We are not aware of his political moves. Here in Oyo APC, we don’t know him"
On the other hand, Ajimobi saluted his defection like it was a written script being acted out. Governor Abiola Ajimobi described Alao Akala as a formidable force, noting that the coming together of both of them would make them the most formidable force in the politics of the state and any opposition will become inconsequential. In explicit terms, this is a formidable force against the electorates to propagate their personal interests surrounded by money and power. My dear people of Oyo state, this piece wasn't written to castigate any leader. It’s more of a comparison between the dark past which the people left and their present of illumination. The past here is seen fusing with the present which doesn't spell an advancement. I salute the dualization of roads by Ajimobi. I appreciate the 'Operation Burst' security initiative which has helped to reduce crime and disband thugs. The electorates were not disenfranchised in the last election and it’s great to announce the curfew set by the state government was a mere formality due to the peaceful political climate of the state. Top companies have been moving down to Ibadan from Lagos to exploit the cheapness of labour and productivity as well available market for their services. It’s been long since the crisis of the National Union of Road Transport Workers; NURTW hijacked the headlines through bloody crises. The NURTW used to be a recruitment ground for fierce political thugs who blindly take sides with the 'politrickcians' at the expense of their lives for little stipends. All these and many more could be applauded. The recent defection of Akala brings me to the realization of the fact that the electorates are always the victims while politicians are only stage actors employing the principle of 'Make-belief'. We have read about incessant cases of political thugs attached to various politicians clashing with each other during electioneering period during which lives were lost without due honour and compensation. Several able-bodied youths were maimed with faces disfigured with machete cuts and other injuries out of violence while the politicians schooled their children abroad. Today, it will stupefy them in the great beyond there was really no enmity among the politicians but their constant attacks were just an observance of the traditions and culture of politics. Sometimes, I wonder if there is really a 'Change' in the APC circle. There is no criterion or quality scale for the admission of members. There is no clear-cut ideology. APC has become the 'church' corrupt politicians run into to get saved from the anti-corruption war of Buhari which has being tagged 'persecution and not prosecution'. If the leader of the dreaded Boko Haram sect, Abubakar Shekau is granted amnesty today by the Federal Government and he decides to venture into politics with his huge followership, APC may send him a membership proposal to convince him they are the right platform to champion his cause. Akala maybe engaging in paper talks that his defection was in the interest of the people of Oyo state in order to figure out their problems with the ruling party and serve them better, but deep in his heart, he knows it’s for his personal political ambition. He wants to stay relevant. Ajimobi on the other hand, understands the dynamics of politics. He knows the strength of the APC when Akala comes in with his teaming followers. This is a dubious democratic plot against the electorates. It’s a calculated structure to rob them of their golden votes as power is beginning to return to the ballot box in Nigeria like we saw in the last general elections. One would wonder why I am so concerned like I nurse bitterness against Akala but sincerely, I don't. Even the Director of Publicity of the APC in Oyo state expressed his concerns about the coming of Akala. His action was an outright disapproval. He advised Akala to go start from the grassroots politics in Oyo state and make his way to the top by winning support over time. I will keep remembering the people of Oyo state in my prayers as the state has refused to rise to its full potentials. The state has failed to tap into the economic prowess of Lagos state even through the advantage of close proximity to Lagos. The gigantic disparity between the Internally Generated Revenue of Lagos (N23 billion monthly) and Oyo (N1.2 billion monthly) is a slap on the face of the Oyo state government. The people of Oyo state seem to be so used to the strained facilities the government provides for mere survival and no promised future. The hunger for much is absent like we have in Lagos. We need a government that will at least create a synergy between the economies of Oyo state and Lagos state so that companies highly congesting Lagos can be forced to move to Ibadan thereby creating employment in the city and boosting the economy of the state rather than the government engaging in long-term projects of votes' robberies. The level of poverty in the state is definitely too high. In my last 25 years in Ibadan, I have realized the people have this cultural attitude of contentment and calmness in the face of hardship which causes many to die in silence and console themselves with the unlimited benefits of making heaven. God bless Oyo state! God bless Nigeria.